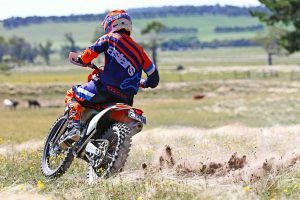 MotoOnline.com.au tests the 2018 KTM 350 EXC-F. Initially released in 2011, the 350 EXC-F is light and nimble like a 250, easy to throw around the single-trail and put where you want on fun flowing grass tracks, being a little more user-friendly with more usable power than the 450. A blast on the tighter trails especially, overall the 350 EXC-F is a really, really enjoyable bike to ride, with a lively motor and plenty of punch. MotoOnline.com.au had the fortune of getting to test the entire KTM enduro fleet out at a private farm on the edge of the Belanglo State Forest with a neat little grass track with plenty of variance in the terrain, off-camber corners, ruts and a couple of jumps. Being so close to the state forest it would have been an error to not venture off into the pine forest to stretch the legs of the 350 EXC-F on the fire trails and get amongst the trees and ride some awesome single-trail. The KTM 350 EXC-F was a completely new bike from the ground up last year. 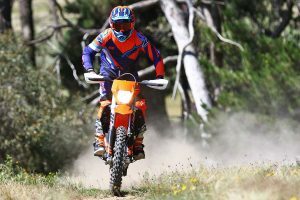 It lost some weight (around three kilograms) and KTM fitted the bike out with a plethora of new features, setting the bar high for the four-stroke off-road market. So it comes to reason that in 2018 not much would change, rather than a few improvements to make the overall package just that little bit better. This time around KTM and WP have revised the settings for the WP XPlor 48 Fork and reworked the radiators guards. WP’s tampered with the internal settings of both the spring fork and PDS shock, giving better front-end sensitivity and improved damping behaviour, while reducing a little bit of weight. A sealed hydro-stop provides great resistance to pushing through the entire 300mm of travel and bottoming out, along with stiffer outer fork tubes, which were adopted over from the SX-F motocross forks. Some notable features that carryover from last year’s model include the No-dirt foot-pegs, a redesigned shift-lever that also limits clogging, the brake and speedometre cable have been incorporated together and ODI Lock-on grips. An electric start is fitted and Brembo brakes are included, along with a hydraulic clutch, which is something that is very familiar from the Austrian manufacturer. The fuel tank is an opaque 8.5 litre tank, taking the guessing out of how much fuel you have left, plus it’s fitted with an integrated fuel-pump and fuel-level sensor as well. Another small adjustment is the fuel-line connector that has been turned 90 degrees to help protect against damage. When the 2018 KTM 350 EXC-F motor was designed, KTM was able to shed a massive 1.9kg from the overall motor package and they didn’t sacrifice any horsepower either. Like the 250 EXC-F, the 350 EXC-F is a DOHC engine fired into life with an electric starter that uses a lithium-ion compact battery. The motor is really responsive, featuring a Keihin engine management system with electronic fuel-injection, complete with a 42mm throttle body. The throttle response is brilliant and the overall power is great from the bottom right the way to the top – it’s like a 250 on steroids. 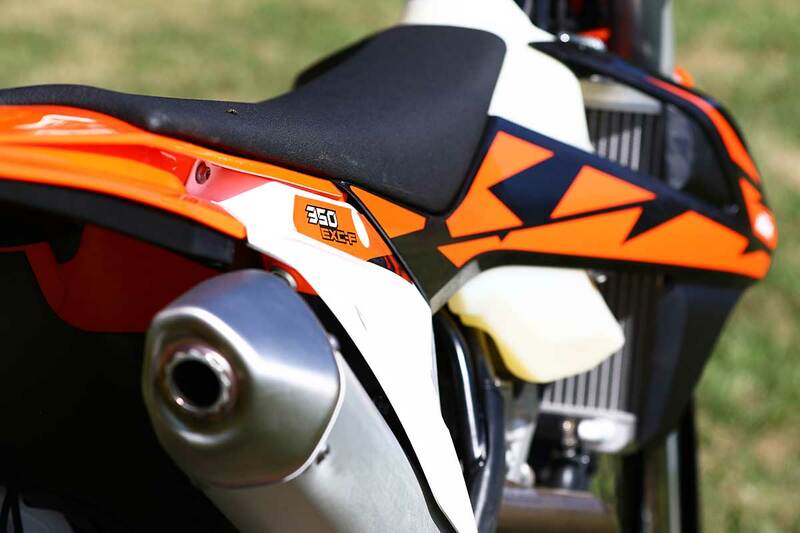 The 350 EXC-F sports a six-speed transmission that has been designed for the purpose of enduro and off-road. 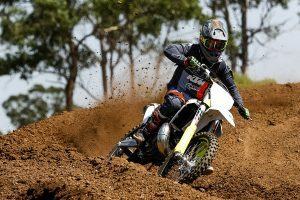 Shifting gears is made easy with low friction coating on the shift forks and a gear sensor syncs up the engine’s power-curve to the selected gear, as well as the track surface conditions. The 350 EXC-F motor is what really makes this bike so much fun to ride. It is perfect for tight trails, boasts plenty of power where you need it and loves to be revved as well. It’s hard to keep a smile off your face when riding this weapon. The 2018 KTM 350 EXC-F chassis was designed around the latest generation of compact, lightweight motors, centralising the mass of the bike to get the best possible handling, working better in conjunction with the new WP XPlor 48mm fork and XPlor shock. KTM has made use of the chrome-moly steel frame characteristics to give the rider improved feel and to better absorb the terrain. The stiffness in the frame longitudinally has been reduced to work better with the suspension and help with rider fatigue, while the frame has been given added lateral stiffness to give a more precise feel and handle better in cornering. It also gives the bike better stability. 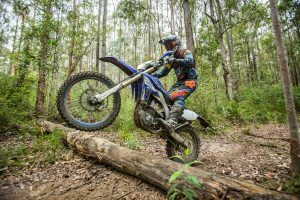 WP suspension is now into the second year of the well-received XPlor suspension and they have been able to further revise the settings for 2018 to provide better handling and more precise cornering. If you are not familiar with the fork, one of the most notable features is the tool-less rebound and compression clicker adjusters on the top each fork leg, rebound on the left and compression on the right. 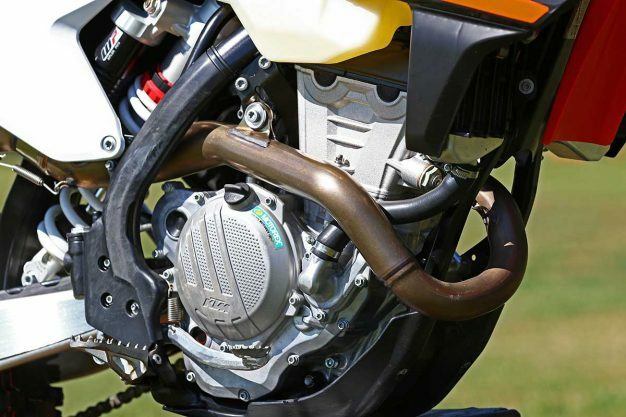 An added aftermarket pre-load adjuster can be purchased from the KTM PowerPart’s catalogue, giving you the added adjustment. 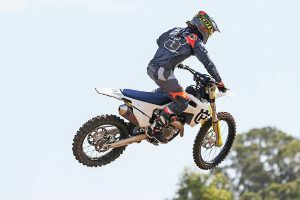 Prior to 2017, the 350 EXC-F PDS suspension has been five millimetres further away from the centreline of the swing-arm and frame, but the new design of both chassis and shock have allowed the mount to be closer to the centre of the bike, which in turn forces the loads from the suspension to be more symmetrical to the rest of the bike, increasing rider feedback. Sitting on the bike it is clear KTM has got it right. From the way the 350 EXC-F looks, to the way it feels when you ride, for the average-sized rider everything is right where it should be. It doesn’t feel cramped, but there is plenty of adjustment, as the Neken bars can be shifted forwards or backwards to customise to your preferences. The bike has a slim feel between the legs, which feels good and really gives you a positive in-control command of the bike. The suspension package front and back are a big drawcard, with a good feel that holds up well in rougher terrain. Put simply, it allows you to twist the throttle further. It has some serious mumbo and, although it’s not the fire-breathing monster that the 450 is, it doesn’t feel as tame as a 250 either. 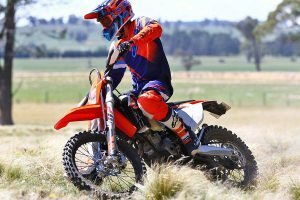 The 350 EXC-F is one of those bikes that are well put together, as the suspension and set-up gives you the confidence to give it a handful and take some chances. But you cant be too carefree, because it has some ponies that will sort you out if you get too complacent. Something that wasn’t fitted during the test of the 2018 model was the traction control and mapping switch, but we had the opportunity to try it on the 2017 model and it hasn’t changed, so that would be a good upgrade once you get your hands on one of these. The TC really comes into play in wet, muddy conditions, but also comes in handy on some technical hillclimbs. If I had to put money down on a bike today, I don’t think I would go past the 2018 model 350 EXC-F. The bike is loads of fun on the open trails and tight single trail and plenty of power to keep life interesting. 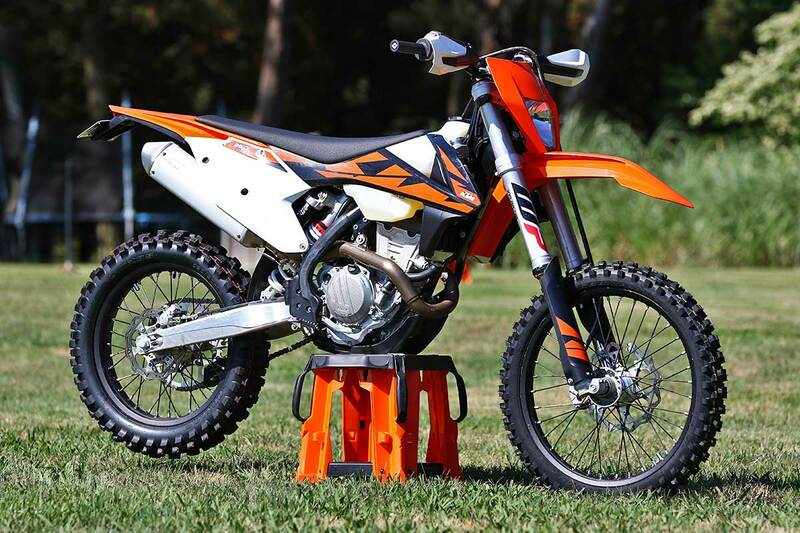 With a recommended retail price of $14,195 plus on-road costs, the 2018 KTM 350 EXC-F is now available nationwide.